The Indian cams here are mostly for Sport Scouts as that is my main interest. Chief cams are the same grind in many cases, but the cam follower (lift) geometry on the Chiefs may change both valve lift numbers and timing. Included here is also the data for the Ollie Chief cams with standard Chief lifts. As you will see from the data, the valve lift and timing depends on the geometry of the cam followers, or lifts, as the parts book has it. The Scout lifts changed over the years. 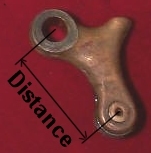 The overall shape got smoother in 1940, pre-40 lifts are angular and chunky, and the distance (see lower picture to the right of here) between the centre of the pivot and the centre of the roller changed as well on a couple of occasions. This is what determines the differences in timing with each of the cams in the chart below. Bonneville lifts for Chiefs differ from standard on both the intake and exhust lift. On Scouts only the exhaust lift is different on Bonneville engines, shorter than the standard lift (Bonneville exhaust lifts can be either old style 1939, one year only, or late style 1940-up). The intake lift is the same on both models. Intake measurements are taken at .006" lift, exhaust at .008". There were 3 types of exhaust lifts, with varying distance between pivot and roller but only one intake. These may be mixed to give some interesting results... If that doesn't suit your needs, several of the old-time racers used to heat and bend lifts to get the distance they wanted. Holes for the roller rivets can also be welded up and re-drilled to change the lift ratio. This is the case with the special short intake lift in the tables. Note that the Bonneville cams don't time out exactly as the printed info on them. With the Four Cam setup, they drove the exhaust valve (with new lobes for the intakes), and the timing was very similar. The big deal with the Four Cams was the greater lobe separation possible. The most efficient flathead engines (so far!) were the KR Harleys, and to match the cam timing of these in a Scout, four cam lobes will have to be used. More about that another time... Click on pictures to see full size! For more Indian cam pictures, please go to the VI Photo Album here. On the Cam page in the Album, you'll also find more lift info as well as info on four-lobed racing cams. And there's more about the Four Cam System here.